These half-sour refrigerator dills solved all my problems. I came up with these HALF-SOUR Hot Refrigerator Dills because I could not find a natural, full-sour fermented pickle recipe that didn’t continue to increase in sourness even after refrigeration. This adaptation helped me make natural dill pickles and then arrest the flavor at my personal peak preference. You can do the same thing using this recipe (see step # 10). I/2 cup raw apple cider vinegar (add after ferment, see #10 final instruction). 2. Dissolve sea salt and sugar in the water to make a brine. 3. Mix together all the dry ingredients (coriander, mustard seeds, peppercorns, pepper flakes, 2 bay leaves). 4. Put the cucumbers in a 2-quart jar, then minced garlic, then spices. 5. Pour the brine into the jar. If you have any brine left, disregard it. 6. Add a few pieces of fresh dill on top. 7. 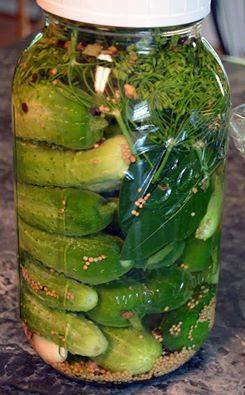 Make sure your cucumbers are completely covered in brine and weight them down if necessary and close the jar. 8. Put in the refrigerator. Let them sit for at least a week before testing and eating. They are done when they taste the way you like them. There is no right answer. 9. Best when made in a half-gallon jar. 10. Option: After 1 week to 10 days in fridge, add ½ cup raw apple cider vinegar and let sit for a few days. After that, these pickles will disappear fast.